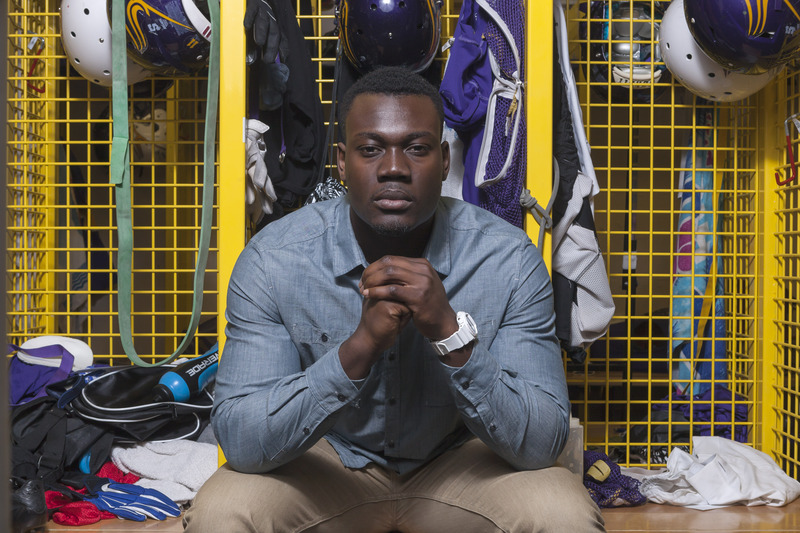 When third-year defensive lineman Kwaku Boateng came to Wilfrid Laurier University, he started building a resume of all the opposing players he ever played against. He created a profile of every player that he would play against in the Ontario University Athletics conference to figure out their weaknesses and exploit them. Not necessarily large in comparison to his offensive line counterparts, the third-year defensive lineman has found success by being tactically prepared for those opponents. This became his recipe for success, as he won the J.P Metras award, given to the outstanding lineman in the conference. By winning the award, Boateng’s name was put forth as the OUA nominee for the chance to win the same award at the Canadian Interuniversity Sport level. Boateng accomplished this in his third year too, which is impressive in itself considering most OUA athletes aren’t recognized until their fourth and final year. According to Boateng, he always sets his goals high, but receiving the award in his third year really shows how strong his coaching staff has been throughout his entire football career. But Kwaku Boateng is not content. The third-year had his eyes set on leading the nation in sacks — a goal he decided on at the beginning of the year. The lineman felt discouraged with the lack of results after a slow start at the beginning of the season. “I was following the process, but the quarterbacks were just releasing the ball a bit earlier. As soon as I got there the ball was thrown so that was very frustrating but my individual goal was to lead the country in sacks,” he explained. Boateng remained a threat on the gridiron, recording four sacks, one per game in the second half, but fell short of leading the conference. Despite not capturing his goal, his coaches remained positive in Boateng’s potential as a lineman, and helped him realize he is still making an impact on the defensive line. “I realized that I am still making a presence, I am still forcing defensive coordinators to change up the game plan every week because ‘Oh, they are facing Laurier, they are facing Kwaku Boateng,’ ” he said. That, and being the OUA recipient is a stepping stone to something much bigger. “My ultimate goal is to be the best lineman in the country. Getting OUA recognition is great but nothing beats being the best in the country,” he said.